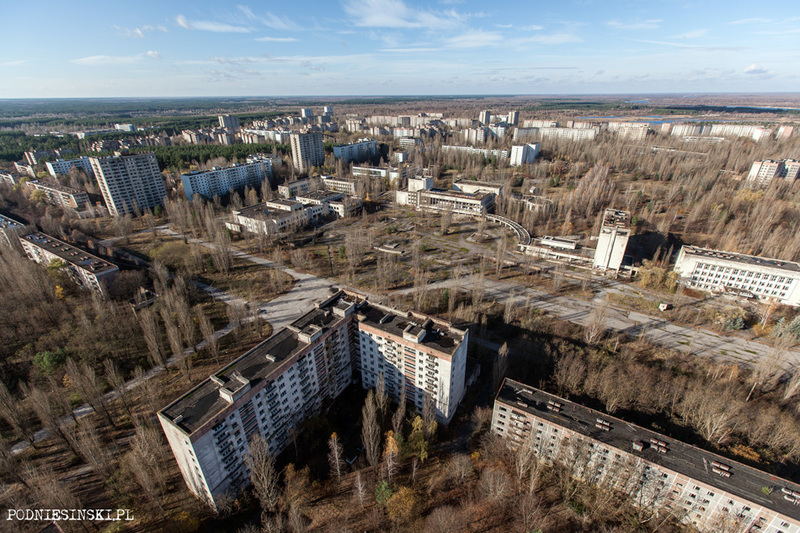 This was a long and productive trip, mainly dedicated to taking aerial photos of the zone and filming places which, for various reasons, didn’t appear in the first part of Alone in the Zone. Either we didn’t have permission, the material was blurry, it was raining or we were just out of luck. This time, thanks to this last factor, we managed to film the abandoned vehicle storage yard in Rossoha. It is a storage yard by name only. Of the over 1500 vehicles that were once there, now only several dozen remain. So why do I keep coming back here every time? For the helicopters that are located here. The helicopters which, despite multiple attempts, I have so far only been able to see from afar, from the road running alongside the storage yard. This time I was able to enter the terrain of the storage yard and have a look at them from up close. Once there were 10 of them, but now only 4 remain. 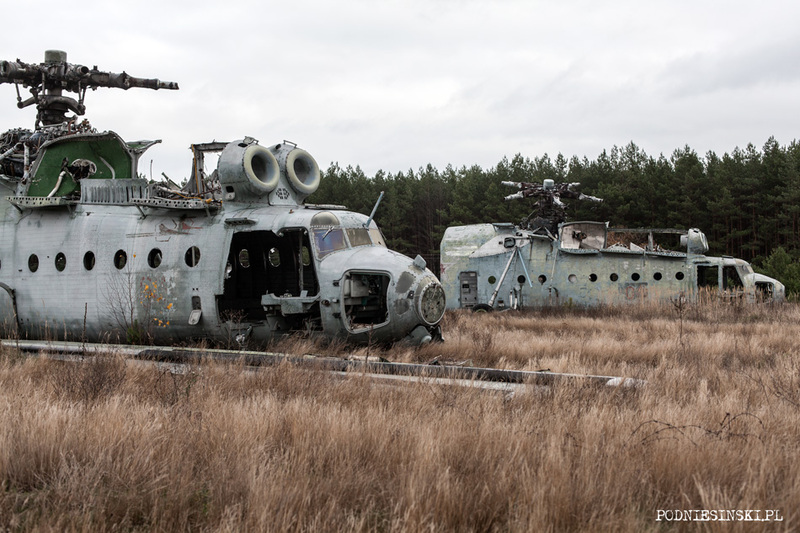 Mi-6r helicopters. 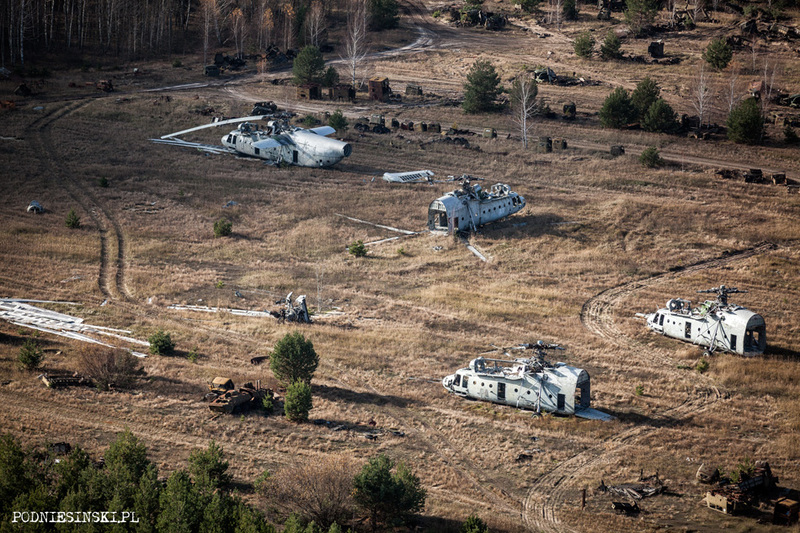 Surely you’re asking – what’s so interesting about these helicopters? 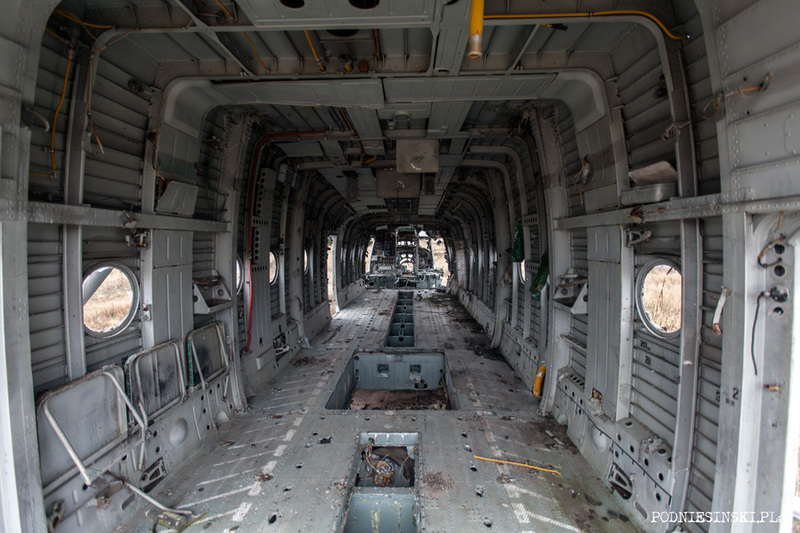 Stripped of their most valuable components, as donors of replacement parts or a source of original souvenirs. Most of them have already long since landed in the scrap heap. Or, if not for the vigilance of the police, would land on a certain Ukrainian entrepreneur’s garden and serve as an original-looking cafe. Today all that remains are metal shells, stripped of their insides. Fortunately it’s much harder to strip them of their history. From the history of the events that they took part in. 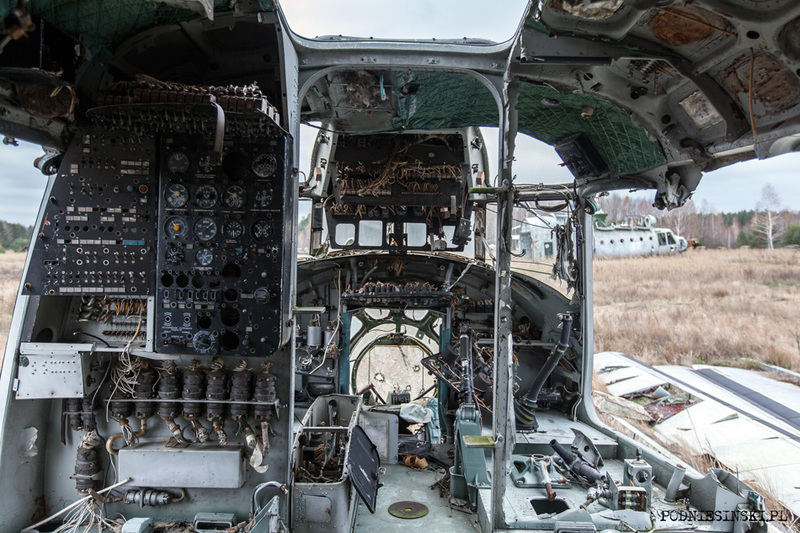 The history of the pilots and crews, people who took part in extinguishing the fire, preventing the radiation from spreading or, generally speaking, participated in eliminating the effects of the Chernobyl disaster. Heroes of a non-existent country. This report is dedicated to them. 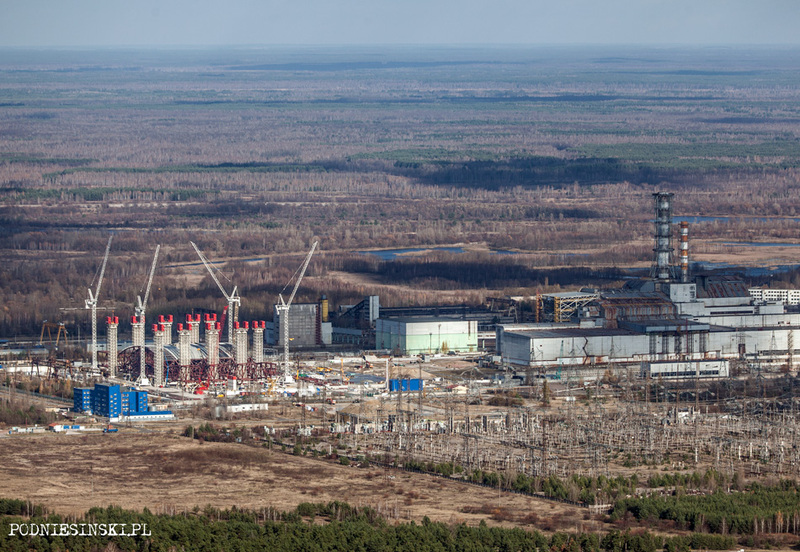 The most frequent task for the pilots and crews was air reconnaissance in connection with visual, radiation, chemical, thermal and engineering inspection of the power plant, buildings and constructions and the whole closed zone. 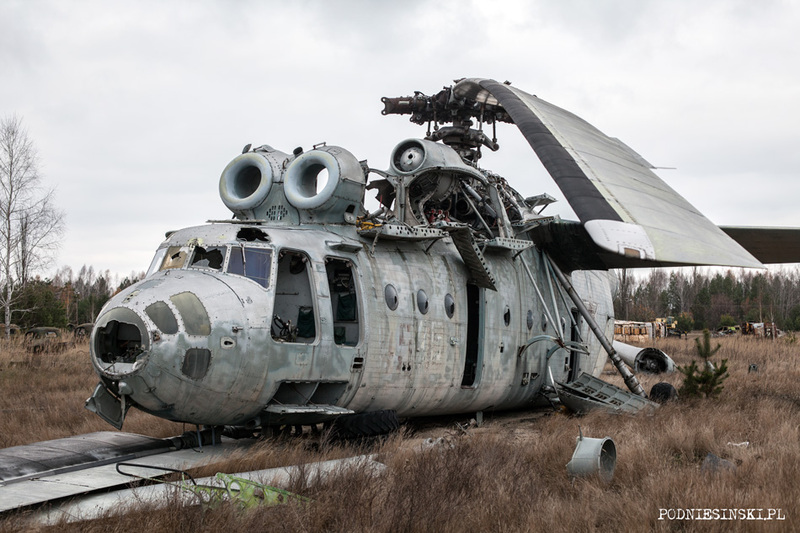 90 different types of helicopters were used for this, mainly Mi-26, Mi-24, Mi-8 and Mi-2, operated by over 900 pilots. The decision to use them came several hours after the disaster. 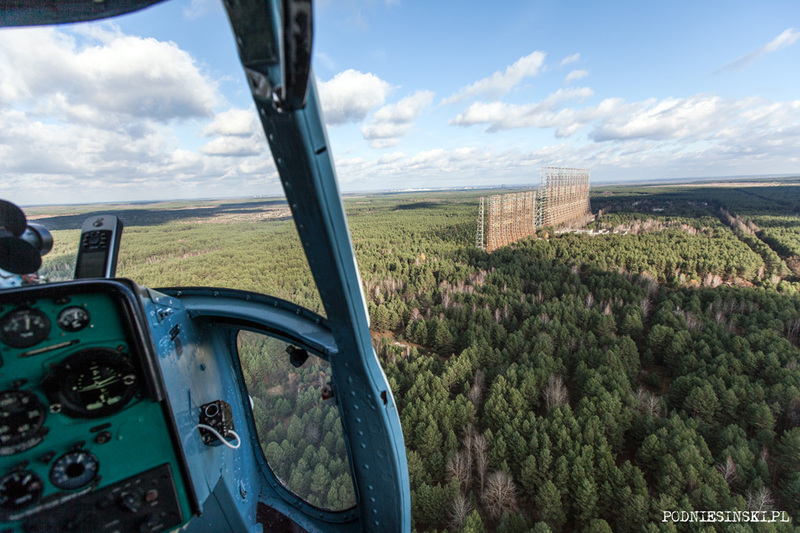 The precise level of radiation above the reactor could be measured by the crew of a hermetically sealed Mi-24. 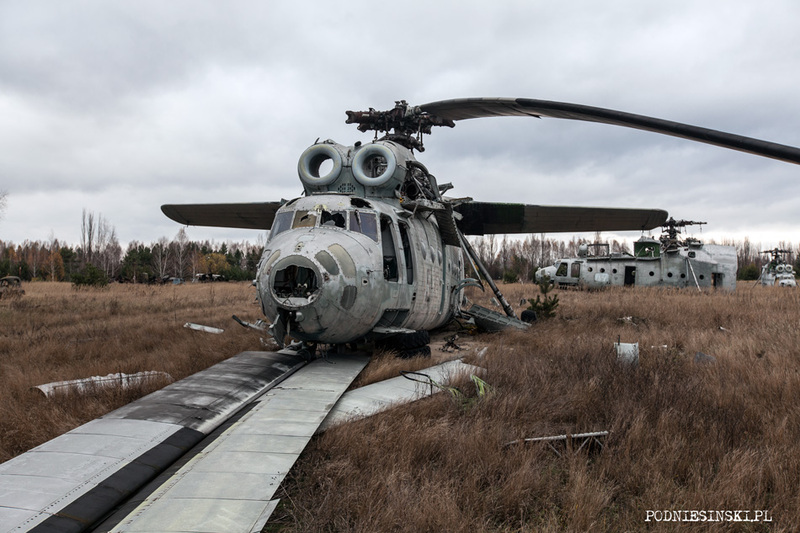 Only this kind of helicopter, equipped with special lead coating, filters, systems for improving the air quality and tools for measuring could make regular flights over the reactor. Seven were carried out. 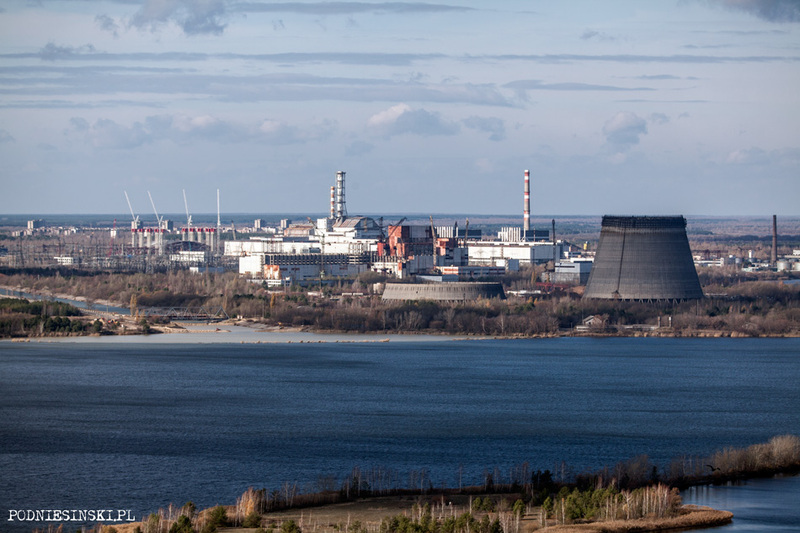 At a height of 200 metres above the reactor the needle of the dosimetre slid to 3 000 roentgens, and in some places near the reactor it exceeded 20 000 roentgens per hour. This means that it was possible to receive a lethal dose of radiation in only a few minutes. 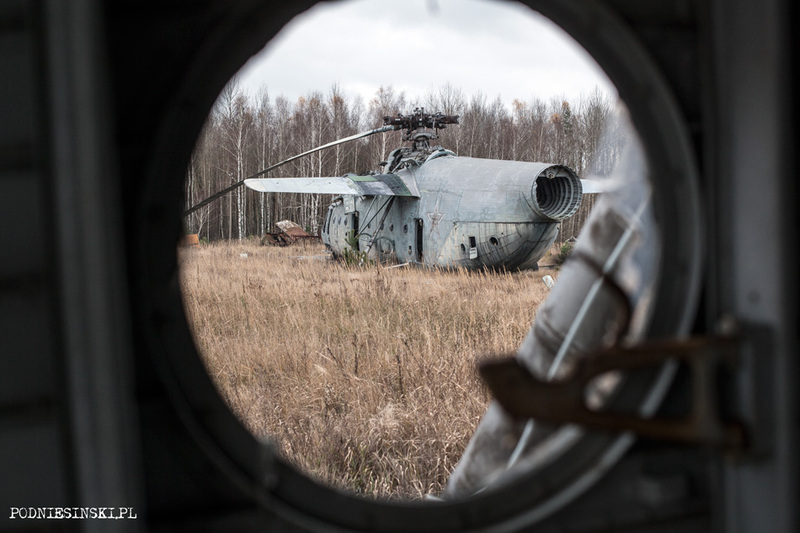 I found two of this type of helicopter during the previous visit to the zone in the vehicle storage yard in Buriakivka LINK. But the most difficult and dangerous task facing the pilots was extinguishing the burning graphite and preventing the diffusion of radionuclides (radiation). Mainly by scattering thousands of tonnes of various types of loads, mainly lead (radiation absorber), sand and mud (decreasing the diffusion of radioactive particles), dolomite (better heat exchange and a source of carbon dioxide causing the fire to go out) and boron (neutron absorber). Initially the loads were scattered by a helicopter hovering motionlessly over the reactor. But this was an ineffective and extremely time-consuming method and it mostly threatened the crew with very high radiation (after 2 or 3 flights the pilots had received the maximum doses of radiation). More effective methods of scattering the loads were worked out by trial and error. The best turned out to be scattering the loads from a helicopter that was constantly in motion. In this way the crew’s exposure to extremely high radiation was kept at a minimum. But this was less accurate, a significant amount of the loads didn’t reach their targets. 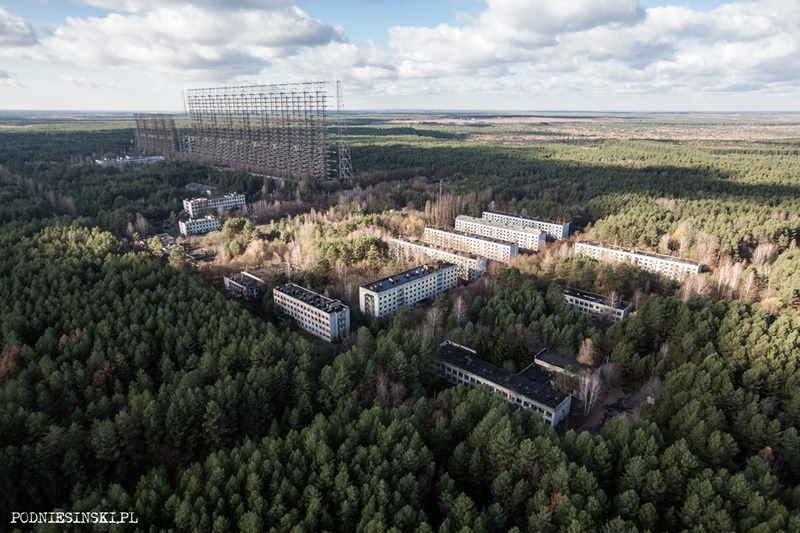 Thousands of tonnes of scattered material also weakened the construction of the building and kicked up an enormous amount of radioactive dust into the air. Unfortunately, given the extremely high radiation level, other methods of getting close to the reactor weren’t possible. This was proved by fire-fighters who were the first to appear on the site of the disaster and, unaware of the danger, made it onto the roof. They were the first to die (not counting the power plant workers). The act of extinguishing the burning reactor was the first such operation in the world. In this way, approx. 1800 flights were made, on average every 2 or 3 minutes, with no breaks. 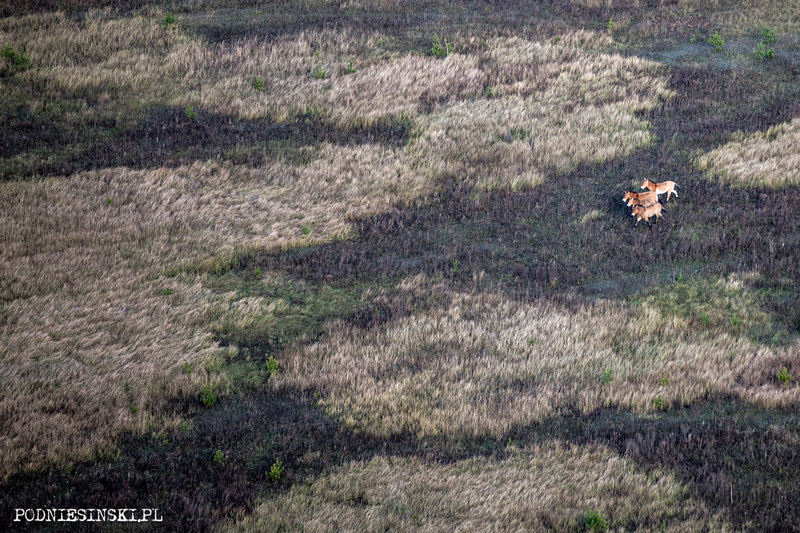 While one helicopter scattered a load, another started up. But in the end the fully dedicated work of hundreds of people bore the first effects. On May 6 it was possible to continue work at ground level. 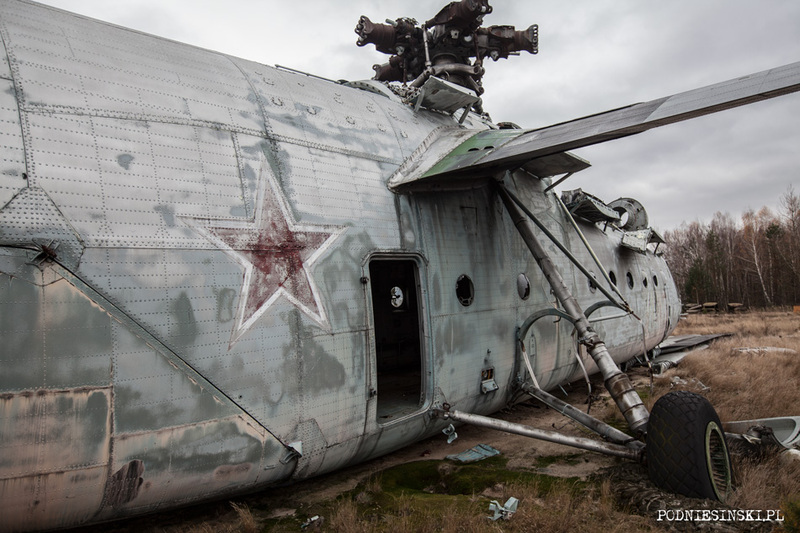 Pilot and helicopter test pilot Nikolai Mielnik found himself at the site of the disaster in a completely different way. 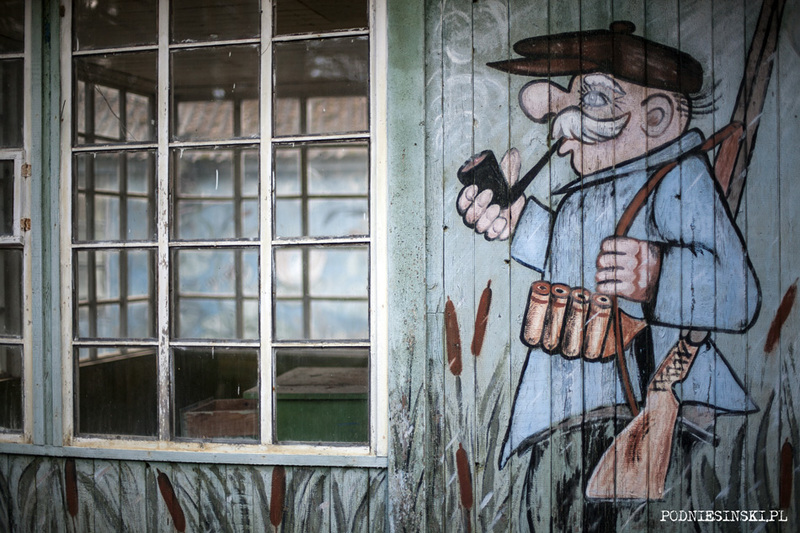 Even before he found out about his mission in Chernobyl he was summoned, along with his colleagues, to the Ministry of Aviation Technology in Moscow where their skills were tested in quite an unusual way. They were invited to take part in demonstrations for several national dignitaries in which they were ordered to put a one tonne metal cone into a hastily painted square from a height of 300 metres. It soon turned out that this wasn’t so much a demonstration as an exam. 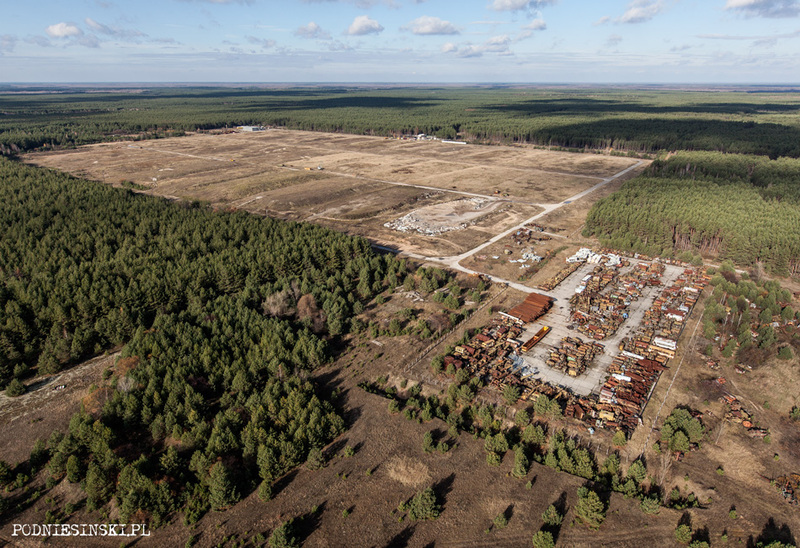 Only Mielnik passed it and soon as a “prize” he was sent to Chernobyl where he got to know the details of the planned actions, very similar to what was done in Moscow. But with one difference – this time he had to do it on the damaged reactor. The extremely high radiation limited the time Mielnik could stay near the reactor. It was usually 5 minutes, although there were situations that demanded a longer stay. One of them was a 27 minute operation under the code name “Garland”. An unusually difficult task, based on landing on one wheel on the outlet of the ventilation shaft and putting a cable with measuring equipment inside it. In the strong wind blowing at the time and the high radiation, his attempts more closely resembled the work of a stunt man or a suicidal acrobat than someone trying to lower a garland down a vent. Soon, in recognition of the precision with which Mielnik flew the helicopter, people started to call him “The Jeweller”. His skills were also used in the operation code-named “Needle”. This required flying over the reactor cover where there was an opening almost a metre wide. It wasn’t possible to scatter it as usual, whatever you threw at it immediately melted in the temperature created by the reactor core. Mielnik’s task was to put an 18 metre long pipe with cameras inside it in order to prepare the most effective casing for the damaged reactor. Mielnik achieved even this task and for this service he later received the highest Soviet honour – the title (and medal) of Hero of the Soviet Union. Several years later, in the name of all flight crews that took part in eliminating the effects of the disaster, he also received the prize from the International Federation of Helicopter Pilots, with the comment “Those crazy Russians”, expressing admiration and amazement. Of the four-person crew that took part in operation Needle, three are no longer alive. One died at the age of 39, the second at 40 and the third at 48. Although it wasn’t officially declared that they died as a result of radiation, you have to wonder why they died so young. The significant majority of pilots were aware of the risk they were taking, the high radiation and its consequences. And risk automatically caused stress which was treated in typical Soviet fashion – with alcohol. It was thought that if it’s good for treating food poisoning, why, then, couldn’t it reduce the effects of radiation? And the pretences of safety that they tried to keep up didn’t help either. Personal dosimetres, changing suits after each flight, meals rich in vitamins, medicines increasing the body’s resistance to ionising radiation or creams protecting against radiation. Few people believed in their effectiveness, nor the dosimetre readings which were deliberately lowered. The helicopter crew also took on less dangerous tasks. Spraying the most contaminated areas of the zone with a special liquid preventing the diffusion of radioactive dust. Evacuation of the most seriously ill or injured people and photographic and film documentation. 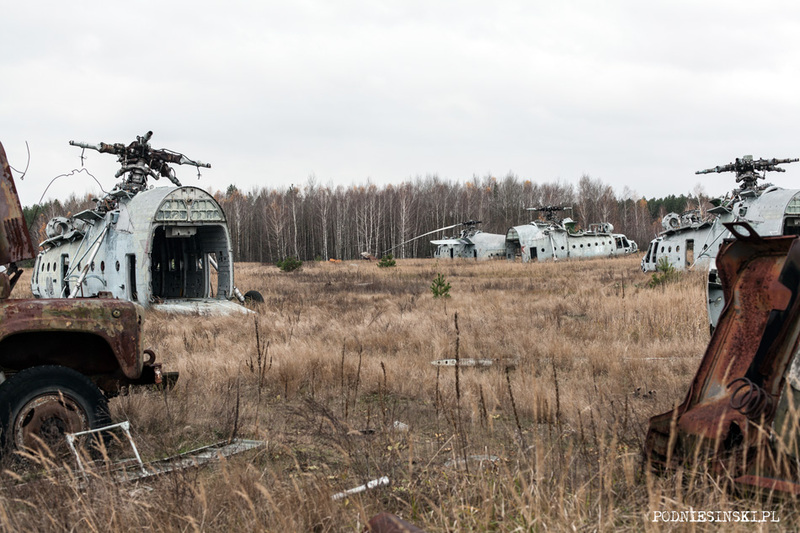 26 years later, with this same task, but now without the risk of radiation, we board an Mi-2. We know that this won’t bring us even one millimetre closer to these events, the views of the pretty, modern city, the snow-white buildings, the well-tended squares and evenly mowed lawns. Instead of this we see a real fight between nature and history. 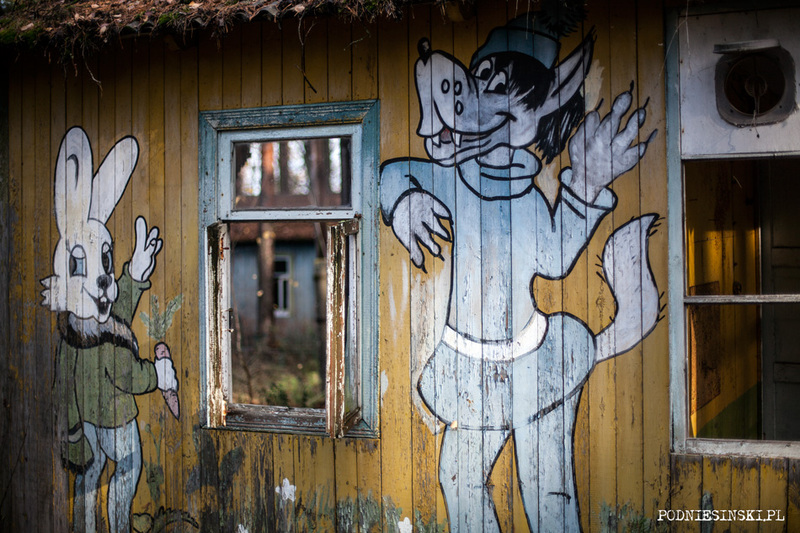 In Pripyat nature is the undisputed ruler, with its vastness it is encroaching ever closer on the complete destruction of the building, school and kindergarten. Turning the once wide asphalt streets into a maze of narrow paths. It undermines foundations, destroys vaulting. The once strong concrete walls are starting to burst, crumble and collapse. What man didn’t manage to destroy, nature has finished off. Like a Ukrainian Angkor Wat. The weather is nice and sunny with good visibility. From a height of several hundred metres you can see the whole city crystal clear. I can finally take the pictures I’ve needed for so long. 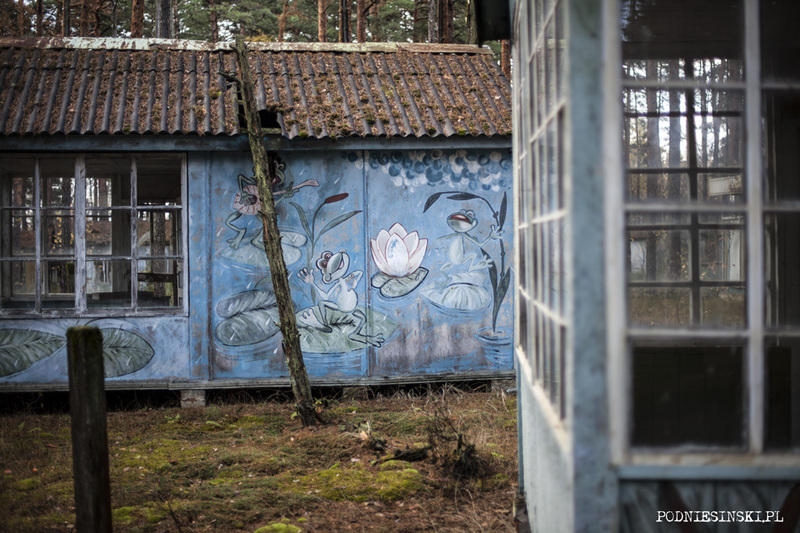 Pictures presenting the panorama of Pripyat with the nuclear power plant in the background. The last time my plans were scuppered by bad weather. 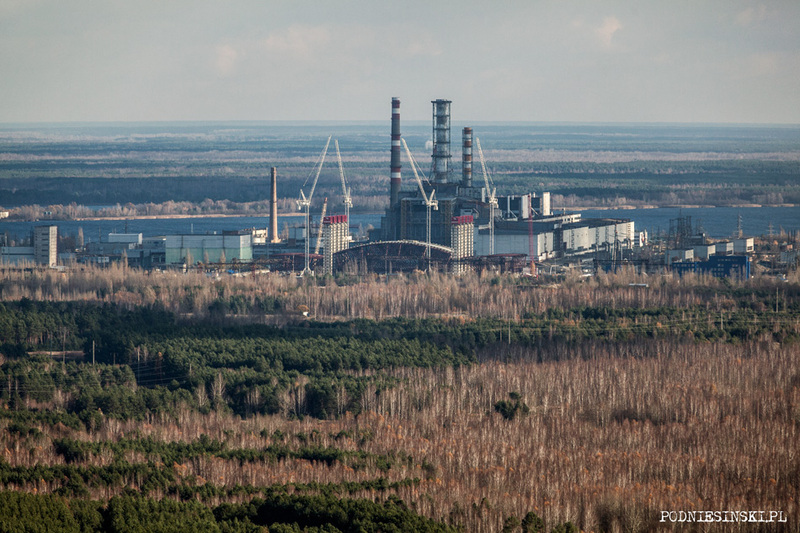 The power plant and the DUGA-3 antenna complex were shrouded in fog. 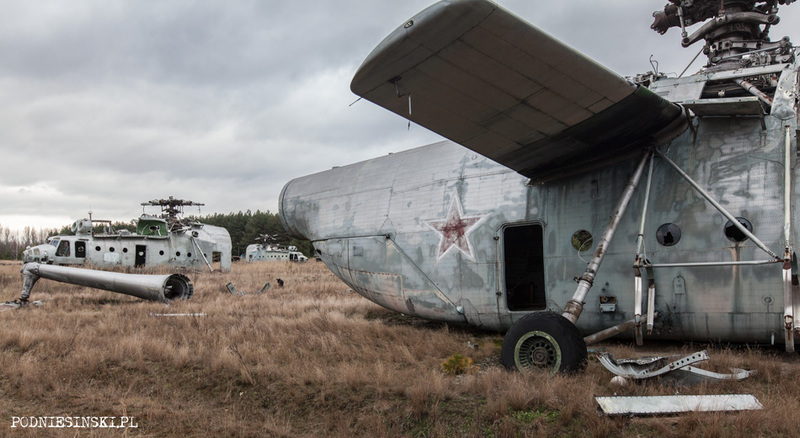 This time we were lucky with the weather and extending the flight to 2 hours allowed for not just taking the planned photos but also filming some material for the second part of Alone in the Zone. And I got to see from the air several places that I didn’t already know about, which I will definitely visit on my next visit to the zone in May 2013. 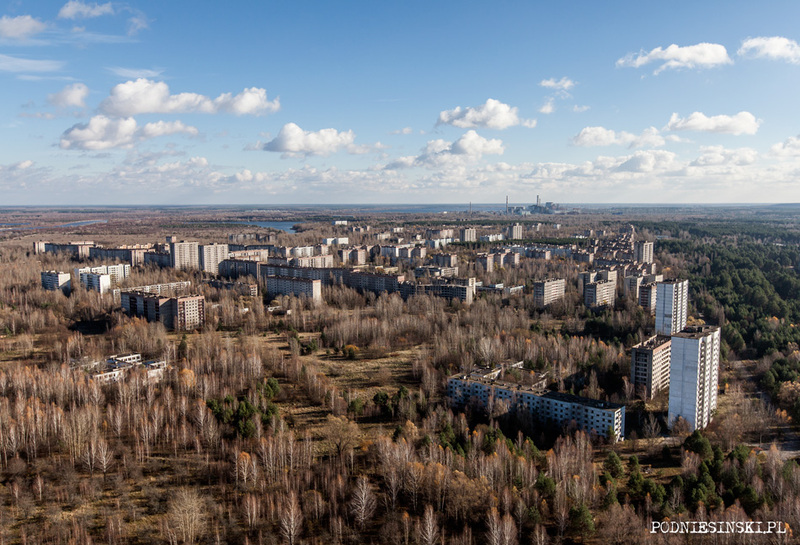 Panorama of Pripyat with the nuclear power plant in the background. 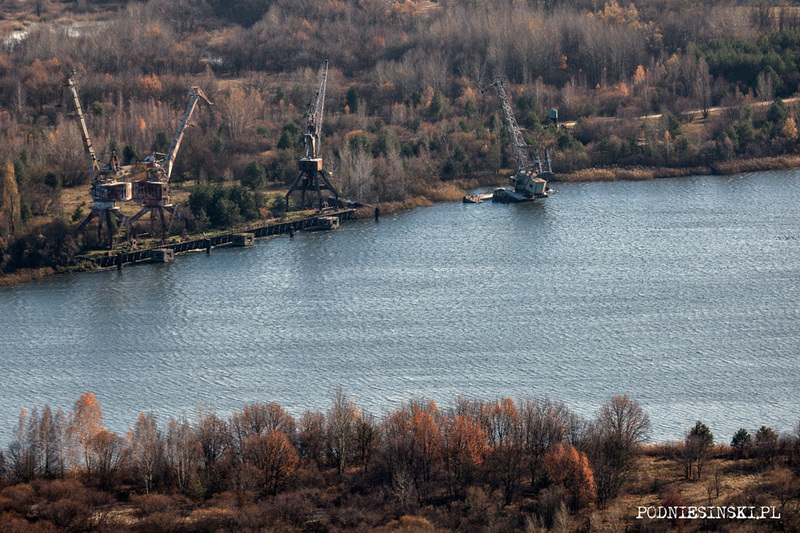 DUGA-3 and the nearby workers’ housing district. The nuclear power plant. 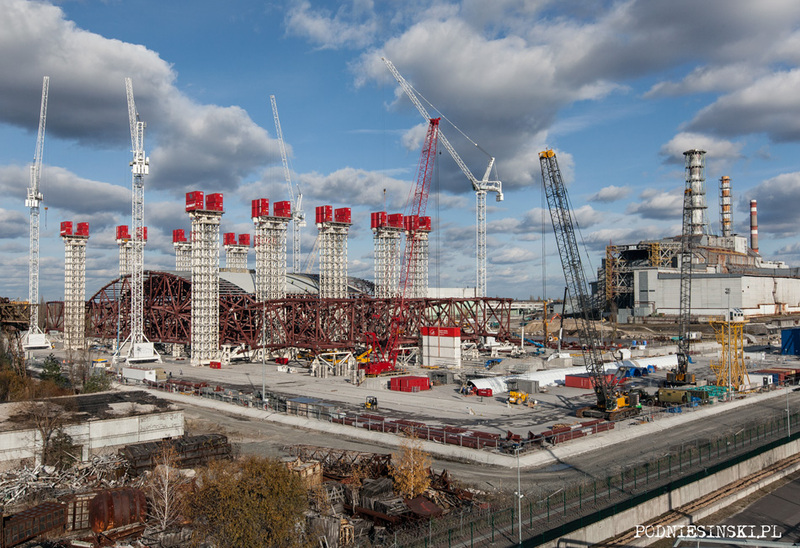 From the left: NSC, blocks 1-4, and in front of them the unfinished block 5/6 and cooling chimney. Storage yard of waste and vehicles, Buriakivka. 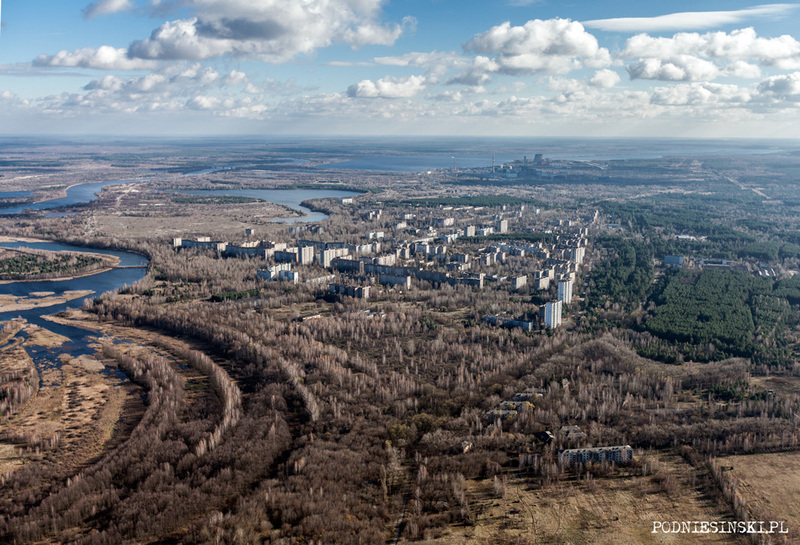 From the air the New Safe Confinement building, colloquially known as the new sarcophagus, is perfectly visible. From the very beginning it was known that the old sarcophagus wouldn’t last forever. Built in a hurry, in extremely difficult conditions, in high radiation, it’s not solid enough to last for dozens or hundreds of years. 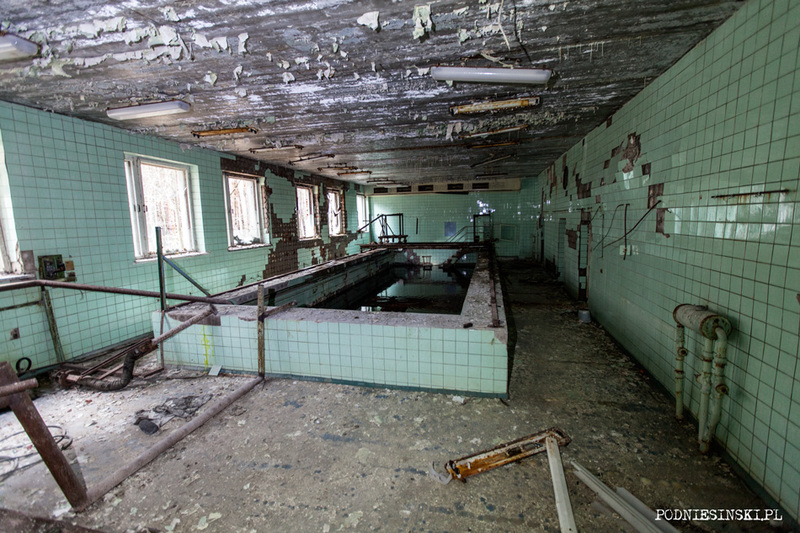 Over the years, the deteriorating technical state of the construction, projected to last for 15 years, also increased the risk of radioactive materials leaking. Additionally, the sarcophagus to a large extent is supported by the damaged construction of block 4 whose stability after the explosion was not examined well. And over 95% of the radioactive fuel is still inside it. Despite the fact that the renovation works carried out extended the period of use of the sarcophagus to 40 years, its time is slowly running out. From the very beginning it was intended to be a temporary construction. NSC – the new sarcophagus construction. Right after landing we make it on to the territory of the new sarcophagus building. Thanks to the permits we got, we can see the progress of the works from up close. Unfortunately we can’t get onto the construction site itself – apparently you need separate permission. I’ll have to sort that out next time. But from the roof of the building we’re allowed to enter, we have an excellent view of the whole construction. The decision to build a new sarcophagus came soon after the disaster. But building works were postponed many times, mainly due to lack of funds and they only started up 2 years ago. According to the most recent data (April 2012) it’s supposed to be finished in 2015. The working life of the new sarcophagus is outlined at at least 100 years. But then what? An even bigger sarcophagus that will cover the old one and the one that’s currently being built? No. The planning of the new sarcophagus didn’t only focus on the safety of the old one. The new sarcophagus doesn’t just have to reduce the harmful influence of atmospheric conditions, rain, snow and wind on the current construction. 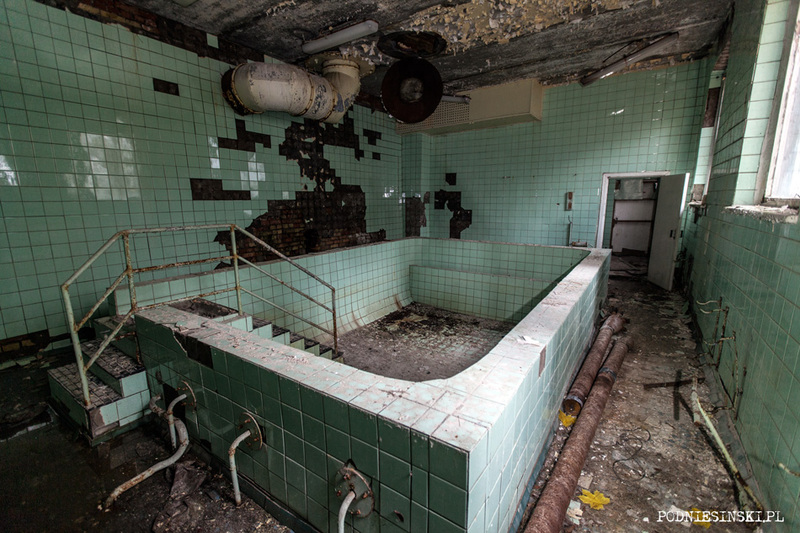 It also has to reduce the consequences of a possible collapse of the old sarcophagus and the fourth block itself, which would mean uncontrollable release of thousands of tonnes of radioactive materials. But an equally important reason for building the new sarcophagus is the safe dismantling of the unstable constructions of the old sarcophagus (and possibly even taking all of block 4 apart). This will be done by two remote controlled bridge cranes fastened to the inside of the new sarcophagus. Then all the larger elements of the construction will be cut down in size so that it will be possible to decontaminate them. This will be done using sand-blasters and grinders to remove the surface, most radioactive, layer of steel (sand-blasting) and concrete (grinding). The ubiquitous dust will be removed using vacuum cleaners. That way the prepared elements can leave the inside of the new sarcophagus and be brought to a site for safely storing materials of low and medium radioactivity. After this stage is finished, it will be possible to get the most radioactive materials, FCM (fuel containing material) out from inside the sarcophagus. The method of removing them is still in the phase of planning and preparing appropriate technology. As is the construction of deep geological landfills for storing them. It’s estimated that their construction will last for the next few decades – we won’t be free of the radioactive problem any time soon. You can see the process of constructing and building the new sarcophagus in the films below. During this visit I again resolved to visit the Shmaragd holiday resort. I always like to return to the most picturesque (also in the literal sense) places. 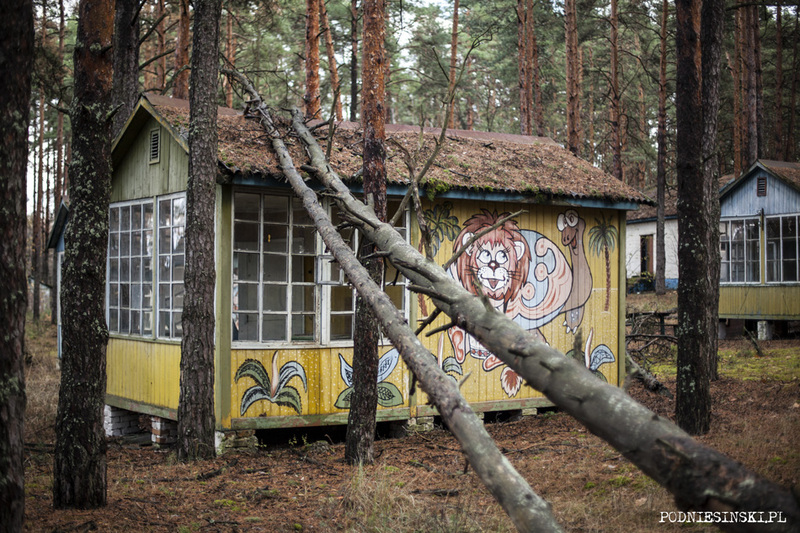 Several dozen hand-painted little wooden houses in which the children of people working in the zone spent their summer holidays. This time I also took my camera so you could see them in Alone 2. 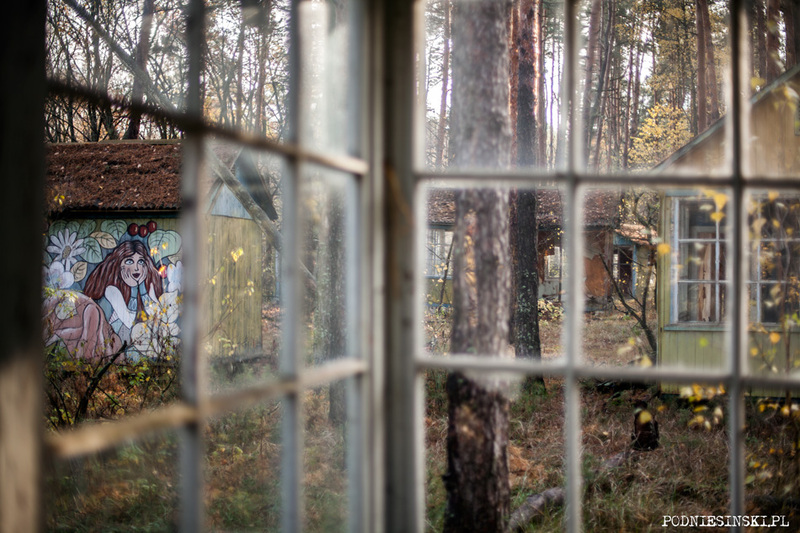 For everyone who’s impatiently waiting for the premiere and following the progress of work on the second part of the film – I’ll give you a little glimpse, without giving away the location of these places. You can guess. The first part of the film can give you some hints, and for those of you who haven’t seen it yet this is the last moment to buy it and also a chance to buy the second part. Since Christmas is coming, if anyone is still looking for gifts you can go HERE. Leaving the first exclusion zone (10 km from the power plant) we have to stop at a dosimetre control point to have our car inspected. From here you can see the increased level of radiation outside zone 1, most likely the result of starting to build the new sarcophagus, the heightened regulations as well as the personal dosimetric gates installed in this place. From here passengers are also obliged to check for the presence of radioactive contamination. 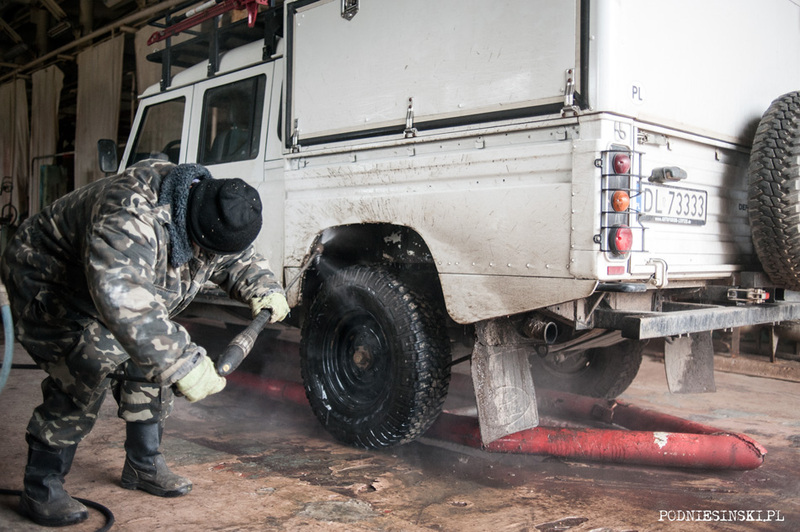 This regulation, for some reason, doesn’t apply to drivers, so at this time I have the chance to have a look at the work of the dosimetre operators who are diligently checking the level of contamination of my car. They approach each wheel and measure the radiation level of each one. It was always okay, but when the operator stops for a longer time on one side of the car and looks at the reading several times it’s nerve-wracking. I look over his shoulder at the dosimetre reading, 289, 301, 310. 310, but why? I ask, and instead of an answer I just get the information that 100 is allowed. What are the scale and units? And where could we have gotten so much? I wonder. 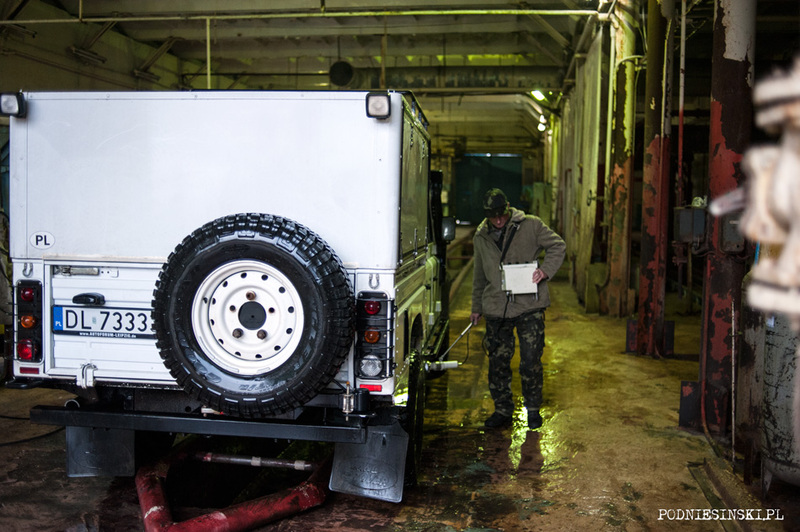 A quick recount of events and only one possibility comes to mind – the ride by Land Rover around the storage yard in Buriakivka. And now we’re having trouble leaving the zone because of it. Luckily after an hour of bureaucratic wrangling we’re directed to a special pool where it ends in decontamination by water. Dziękuję panie Arku za kolejny wspaniały reportaż z Zony :) Nie mogę się doczekać Alone 2.